What is Motor Cycle Monthly? 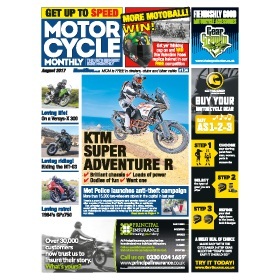 Motor Cycle Monthly is the printed, monthly version of the ever-popular MoreBikes.co.uk and you can have it delivered to your door for less than £1 a month. Packed with the news, detailed reviews, bike tests, products, events and more that you know, trust and love, plus hundreds of bikes for sale every month, it’s the perfect printed accompaniment to MoreBikes.